In November The Barlow RC High School received a monitoring visit from of a team of Section 5 inspectors. The inspection took place under the new August 2016 OFSTED framework and the report is now available on the school’s website. 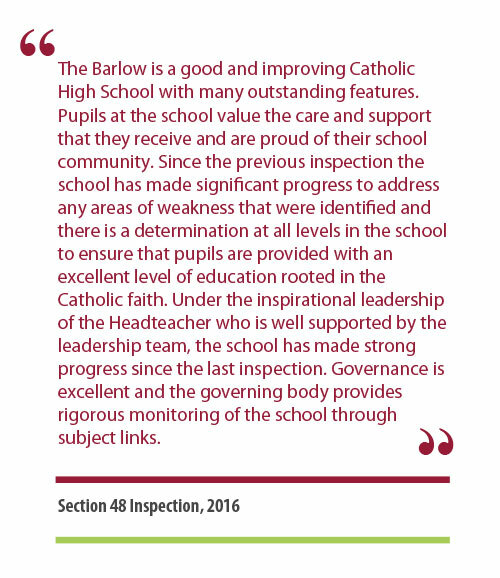 Leaders are very pleased that inspectors accurately identified the many strengths and areas of success at The Barlow in their report, as can be seen in the above statements taken from the report. We are particularly pleased that they noted the strength of the curriculum, as well as the very strong achievement made by students in the majority of subjects which perform above National Levels. Also, the fact that as a consequence of this:”the very high number of pupils that go onto further education, employment or training”. They agreed with Leaders at the school that the performance in Maths and Science were areas for improvement; caused in the main part by national recruitment issues in these subjects, something which was beyond the schools control. Inspectors saw that the school has now addressed this issue with new leaders and teachers in post and noted that”already the impact of their leadership can be seen in the progress pupils are making”. Inspectors noted the high standards expected of pupils at the school and, in line with the school’s self-evaluation, judged that the behaviour of students at The Barlow is ‘good’. They identified that attendance of all pupils is above national levels and they described our students as:”Articulate, charming and proud of their school”.They commented that Leaders are”unrelenting and watchful in ensuring that pupils are kept safe, especially the most vulnerable”. Improve the quality of provision for pupils that have special educational needs or disabilities. Ensure Pupil Premium funding is used on strategies to improve the achievement of disadvantaged pupils. Improve the standards in Maths and Science. There is no doubt that the school was significantly affected by national recruitment issues and a number of unavoidable staff absences last year and this consequently had an impact on outcomes in Maths and Science, and therefore the judgement on overall school effectiveness. Leaders and Governors at the school are absolutely confident that these issues have now been addressed and we continue on our journey towards becoming an outstanding Catholic High School for the students that we serve. 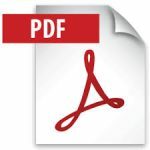 Following a visit from a team of three Diocesan Inspectors to The Barlow RC High School in September 2016, when they met staff and students, I am writing to inform you that the Section 48 report is now available on the school website. Inspectors who visited the school said that they were very impressed by many aspects of the school and in particular by how our students care for each other as a community in which everyone values and respects each other for who they are. They went on to say that the culture of welcome at the school is a strength with pupils and staff recognising, valuing and celebrating diversity at all levels. The quality of welcome ensures that pupils staff parents and visitors feel respected and valued while subject to the stringent safeguards that the school has in place to keep pupils safe. Inspectors judged the schools overall effectiveness as “Good” and identified the areas of Welfare, Welcome and Witness as” Outstanding”. The vision and commitment of the Head teacher, Senior leadership team and Governing Body which has provided the catalyst for change and the determination of all who work at the school to provide a successful Catholic learning community. The quality of relationships and the care and welfare of all students, including outreach and support for the most vulnerable. The highly skilled RE team with excellent leadership which is fully committed to providing an outstanding Catholic education for all pupils and which has led to sustained improvements in GCSE results in Religious Education. Encourage pupils to take a greater lead in the prayer life of the school. Ensure all departments engage with the “Big questions” and that all staff are able to articulate the that policy and practice are driven by the schools mission. All recommendations identified by inspectors were already in the schools improvement plan and we are confident that the school will continue its journey towards outstanding in the forthcoming years.